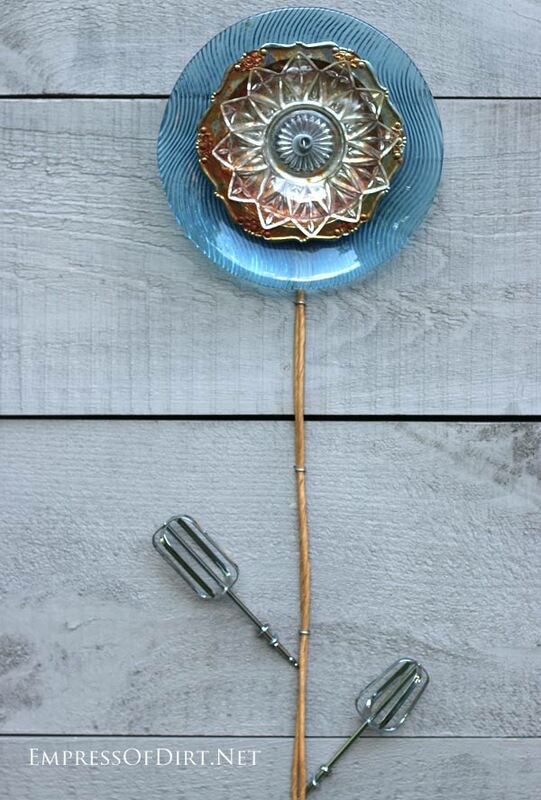 Using old plates and dishes and some kitchen utensils, you can create these garden art flowers for your backyard. 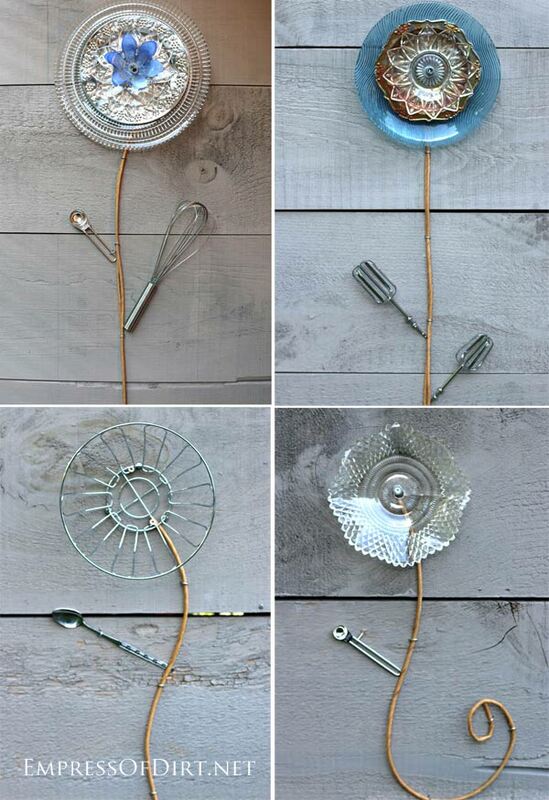 For more, also see DIY Garden Art Flower Tutorials with a bunch more projects. 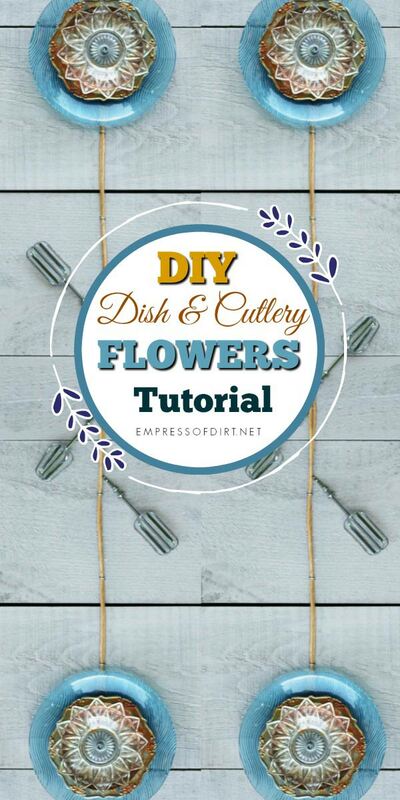 The first step is to create dish flowers using this tutorial. Once you have your flowers ready, it’s time to add stems and leaves. 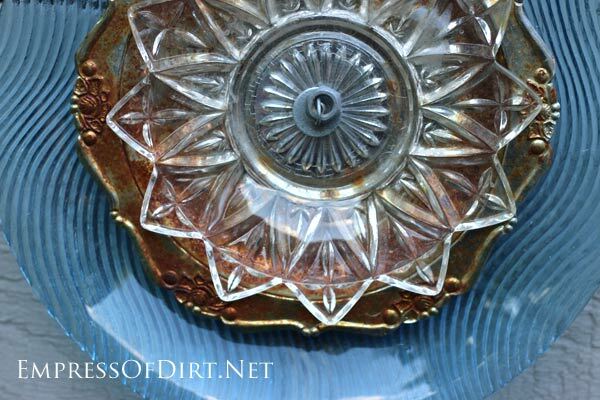 I had the dish flowers displayed in the garden but, due to the sandy soil, I found it hard to keep them in place. Everything falls over in sandy soil! Time to mount them on the wall, I say. I hung mine on a patio wall. You can see my collection of blue glass through the window. Pre-twisted seagrass rush or similar thick twine (for stems). 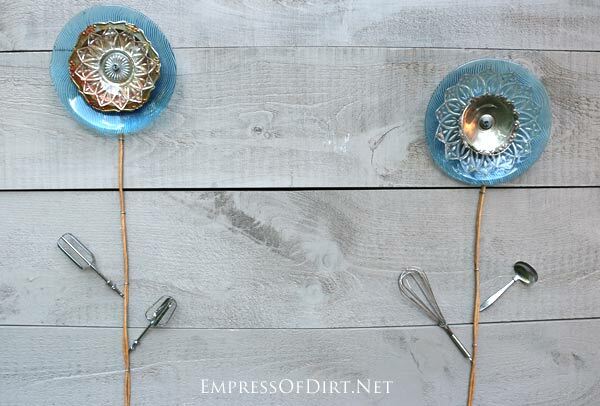 You could also use old garden hose or twine. 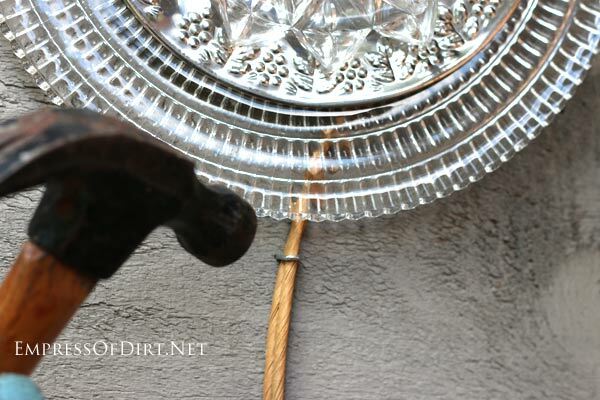 If you need to glue anything, see The Glue Resource Guide for Garden Art Projects for more options. 1. Plan flower arrangements choosing which utensils to use for each flower. 2. 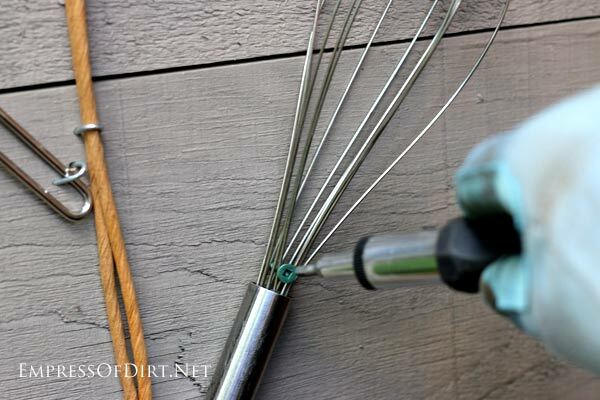 Attach flower to wall, then add stem (rush seating twine) with poultry tacks. 3. 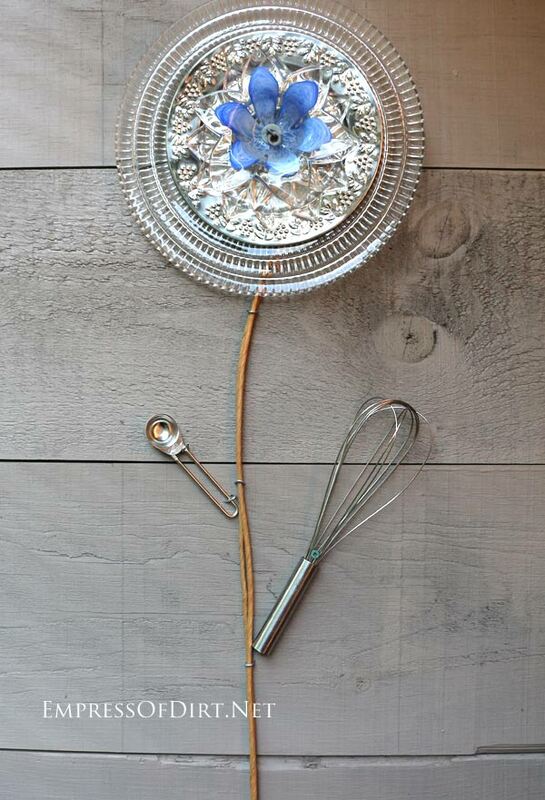 Add leaves (whisks, spoons, forks, beaters from electric mixer, measuring spoons…) with screws or poultry tacks. 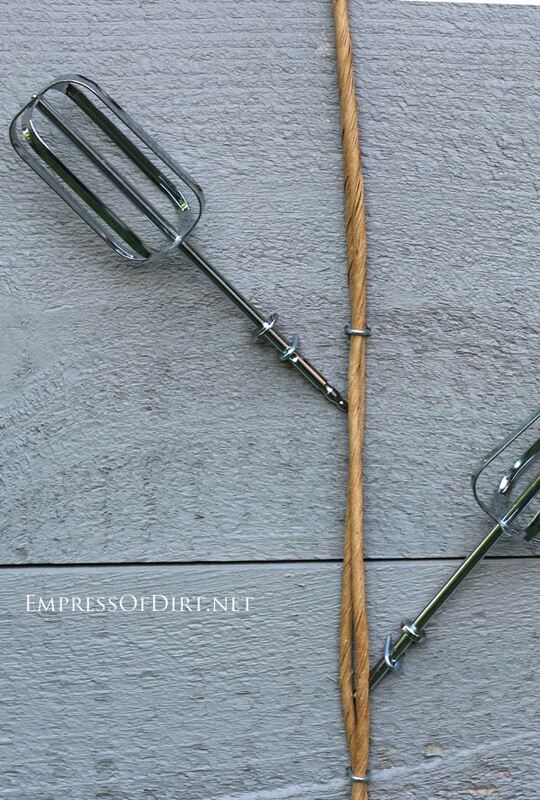 At last: the unwanted electric mixer beaters of the world have a purpose! Here’s a closeup look at some of the finished flowers. 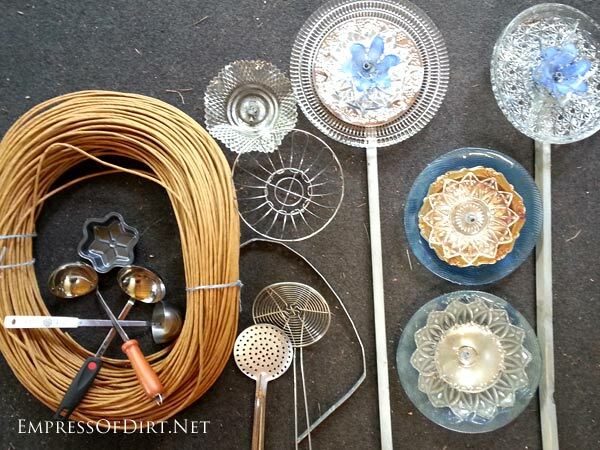 The (bottom left) one is made from a metal basket-type thing I found (and have no idea what it’s supposed to be used for). In case you’re curious, those are my surplus tomatoes growing there (planted very late-we’ll see if we get a summer long enough for them to ripen before the frosts set in). I’m sure I’ll be adding more to the wall but for now I like how it adds some art to the entrance to the garden. 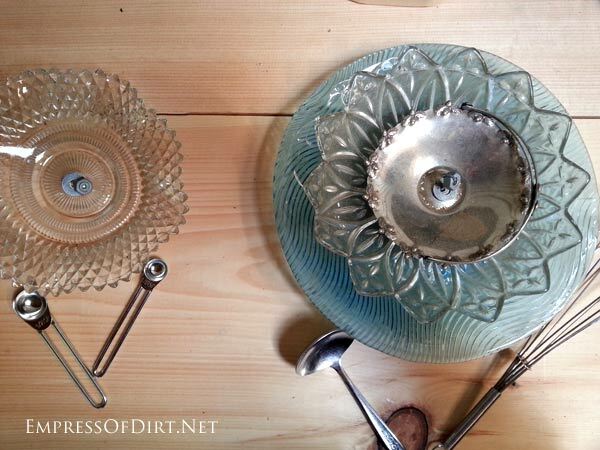 these are great, how did you drill the holes in the glass plates? Thanks for the inspiration! ive looked at lots of adhesives, which one besides the two apoxys mix that will dry clear, with stand all weather elements, and strong enough to hold several plates and a hook. I wanted to put some inside my home as well and didn’t want to screw them in. I’m in love with your blog! 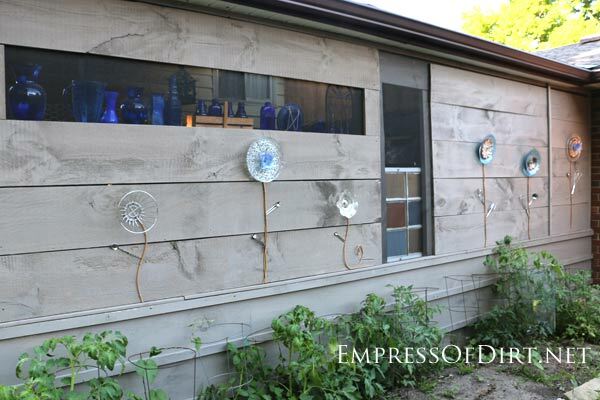 It may be summer and the almost end to gardening, but it will give me a lot of time to make your fun ideas. Love the flowers on the building! Oh, and by the way, I think the unidentified object, is the cover to a fan!? Keep up the great work! I love your wall of flowers. Mine are in the garden, and I keep asking everyone who makes them , what do you do about the water spotting? 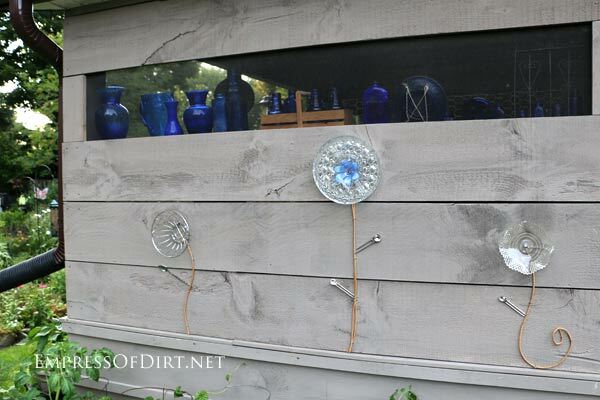 We have irrigation water and all of them plus my blue jars are just coated with water spotting. I don’t have anywhere out of range of sprinklers to put them. Thanks for your blog, I love what you do. And as far as being empty nesters soon, you will be so busy you won’t know how you did everything before ! No tools required. Just adhesive. I LIKE that extra “twist” — fastening the to a structure and THEN adding the “leaves”! How clever.